If you need any more ideas of how to hijabify that maxi dress, the runways provide plenty of inspiration. Try experimenting with light parkas or cropped jackets like those seen at Akris and Y & Kei. Or try teaming structured blazers with dresses that have full skirts like those at Carolina Herrera. Alternatively, a long, soft cardigan is a wardrobe staple and can be used to provide coverage even with maxis. Which style do you prefer? 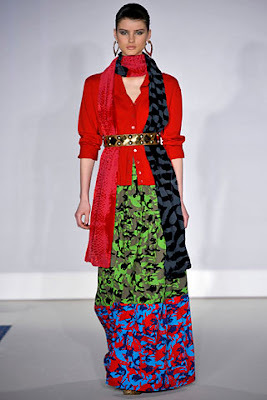 Oh that one from Duro Olowu is lovely. I feel that it depends on the occasion; if I wanted to look more regal and formal, I'd choose the jacket but if I wanted to soften the look, I'd wear the maxi with a cardigan. But, ahhh, those maxi dresses are just gorgeous! I love the dresses with jackets by Carolina Herrara. Another style I recommend is a bolera the same colour as your accessories, or hijab. nice idea. i like the one by akris the best. Good article. Maxi Dresses are fast becoming a hit in the united kingdom they have once again come back from the past. they were last popular in the 30s and 70s and have come back again with a modern twist. 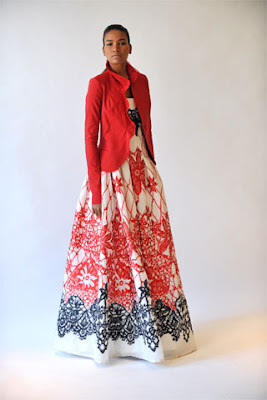 There are lots of great advice out there on Maxi Dresses including my website (Maxi-Dresses.co.uk) Thank you for a interesting read and keepup the great work. but I linked them to your blog in a hope to educate them on hijab and modest dress and how Muslim women are not oppressed and such. I hope you don't mind and again I am sorry and apologize times a million if this brings you any problems. Oh my gosh, I love both Carolina Herrera pieces! I wish I could own the red/white/black one. The jackets are fabulous too. Thanks for sharing these! Nice collections here,I love Arabic style ...Thank you for sharing.